Protein shakes have become so commonplace that everyone thinks they need one. Most people get more than enough protein though, and adding a protein shake to your day just adds extra calories. That said, a protein shake can come in handy as a convenient snack or meal replacement and can help athletes and light eaters meet their protein needs. Whey protein is the most common protein powder because it is complete and well-tolerated, and it is considered the gold standard of protein supplements. As protein powders go, whey protein is considered high-quality. A milk product, whey is a complete protein, meaning it provides all the essential amino acids. The amino acids themselves are in forms that are easily used by the body, so there is very little waste. Whey protein isolate is even frequently tolerated by the lactose intolerant because of the low lactose content. Because it is a milk product though, whey is not suitable for vegetarians who don't eat dairy and those with milk protein allergies -- soy protein is an acceptable alternative. 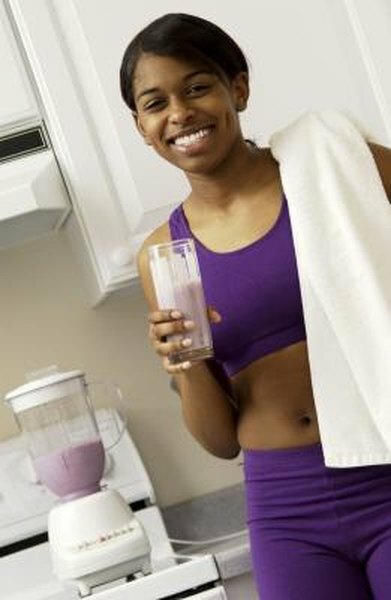 Whey protein digests quickly, which can be a good thing when it's used as a pre- or post-workout shake. In those situations, you want the protein to go where it's needed without hanging around in your stomach. On the other hand, using whey protein as a meal replacement may leave you hungry before your next mealtime because your body processes it so quickly. In that case, try casein protein instead. Another milk protein, casein digests very slowly and will keep you feeling full longer. Whey is the most common protein source for protein shakes, and there are hundreds of different formulas on the market. Some offer high-potency, pure protein, while others provide some carbs and fat, and some are formulated to be very-high-calorie to promote weight gain. This variation means that there's a formula out there for everyone, but it also leaves plenty of room for error. Before you buy a whey powder, decide how you're going to use it. If it's to be a meal replacement, choose one that provides some carbs and is fortified with vitamins. If it's just to help you meet your daily protein needs, determine how much protein you get from food, and choose a pure whey isolate that fills the gap. In either case, keep the calorie content low enough that you don't exceed your body's needs. The portability of protein shakes makes them convenient snacks and meals-on-the-go, but whole foods can be portable too. Protein shakes can be a suitable replacement for food occasionally, but you should not rely on them to meet your nutrient needs regularly. Fruit is easy to grab and go and comes wrapped in its own little protective skin. A bag of cut vegetables or dry whole-grain cereal can suffice when the munchies hit, and sandwiches are the ultimate portable lunch. It's always better to get your nutrition from whole foods rather than supplements, so use whey protein shakes more as an emergency measure than a matter of routine.